Vitamins are a controversial subject. There are some people who say that taking vitamins is just a way of making your urine more expensive. Other people say that vitamins are critical to getting full nutrition. On a low-carb high-fat diet, as with any diet where you are selecting some foods and avoiding others, it’s important to get a complete range of vitamins and minerals. But ironically, it may be easier for us than it is for people who are eating a more traditional diet. For one thing, a low-carb high-fat diet is usually very high in vegetables that grow above the ground. These kinds of vegetables are the ones you always hear are the best ones for you, with a lot of dark colors and rich flavors indicating a high concentration of nutrients. By contrast, people who eat diets that are heavy in grains get a very specific type of nutrition, but may not be exposed to as wide a range of vitamins in their diet. That may be one of the reasons why the supplement industry is so powerful. 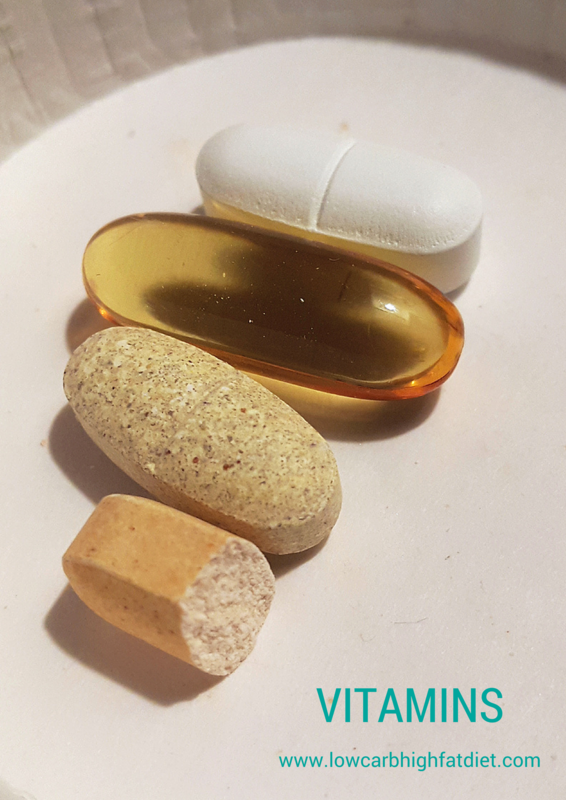 For myself, there are a few supplements that I always take on a daily basis. I recognize that I may be taking more than I need of some, but I’m careful to avoid ones that are toxic in high doses. I also think it’s important for me in particular take vitamins because I am a super taster, which means that there are foods that are difficult for me to eat. I have to avoid certain herbs like cilantro, and a lot of dark green vegetables that have a very bitter taste, so vitamins fill in the gap. Of course, you should always check with your doctor before changing any of your supplementation plans. One thing that I always take is a general-purpose multivitamin. I’ve tried a few different ones, and there aren’t a lot of differences among them. You should make sure that the multivitamin you’re taking has the balance of minerals and nutrients that you prefer. Personally, I like to find one that has a high amount of vitamin D, along with a little bit of calcium, and a good range of the B vitamins. If you’re eating low-carb high-fat, you’re probably getting a fair amount of fish in your diet just as a regular protein source. However, as someone who doesn’t tend to prefer fish, I like to take fish oil to support my heart health. It’s important to consider the source of your fish oil, and make sure you’re not getting one that has too much mercury in it. I generally don’t exceed what the supplement makers recommend, and I take two capsules a day. Although my multivitamin and has a little bit of vitamin E, it doesn’t meet the daily recommended requirements. I like to take an extra dose of vitamin E before going to bed. I’ve noticed that it helps with sleeping, and I’ve read that it’s good to have vitamin E in your system while the body is replenishing itself during sleep. Calcium is important for strong bones, and also for proper muscle performance. Instead of taking calcium carbonate, which is cheaper, I usually take a calcium citrate supplement. Calcium citrate does not need to be taken with food, whereas calcium carbonate is not easily absorbed into the body unless eaten with food. Since people who need a low-carb high-fat diet Can’t eat citrus fruits, because of all of the extra sugar and carbohydrates, I like to supplement with vitamin C as well. A lot of people megadose on vitamin C, so it’s easy to find fairly cheaply. I generally buy the 1000mg tablets and cut them in half, for more reasonable 500mg a day. I take supplemental magnesium and potassium to avoid muscle cramps. I used to suffer from leg spasms during sleeping, and also often get abdominal cramps a day after doing abdominal exercises. (This may be because I’m not a heavy exerciser, but I believe it also has something to do with the balance of nutrients in my diet.) Taking magnesium and potassium aspartate has always helped. The set of vitamins that you choose to take is a very personal choice. You should experiment, and pay attention to what effect the vitamins actually have on you. Don’t take things that you don’t understand, don’t take random supplements just because somebody suggested them, and don’t take anything that doesn’t have a positive effect on you. Read about them, make sure the sources are good, and pay attention to what they’re doing to you. I am not a doctor, but I am a healthy person, and I know what works for me. You should work with your doctor and pay attention so you can find out what works for you.